Serenity has an iron keel which can rust, and must be protected from the air and salt water. Back in 2007 I coated the keel in POR-15. Perhaps my preparation was flawed, or not enough coats were applied, but after a couple of years rust started to bubble through the antifouling. 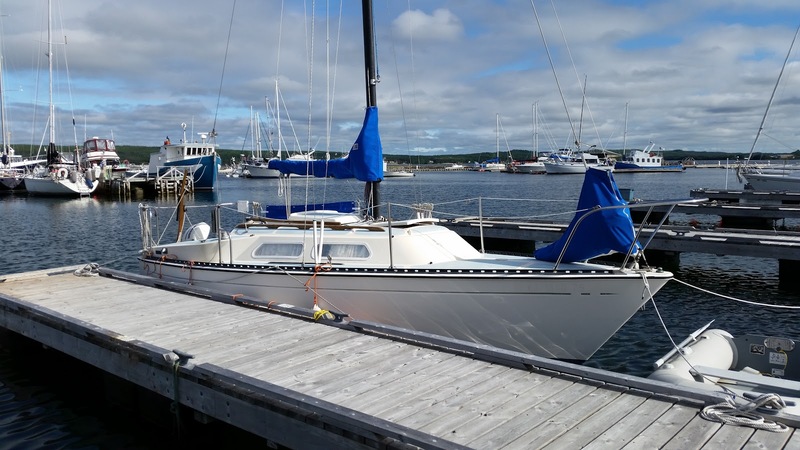 I'd just pressure wash off what I could, and cover it up with antifouling paint to get another season. After a while the amount of iron being lost became a concern, and it was time to tackle the job from scratch again. Doing some "research", I came across a different product called Rust Bullet. It wasn't in stock at the local marine store, so a week of waiting was required for it to be shipped in. In the meantime I did some other odd jobs on my boat, and helped out on boats at the marina. It was also a good time to get a head start on grinding the keel. Not wanting to have to repeat this job any time soon, I took the grinder to the iron ballast three times in total. There was as much exposed metal as I could uncover, and it was looking a good deal smoother. Then I scraped a wire brush over everything, and wiped it with a dry shop cloth. From there three coats of Rust Bullet were applied, after waiting at least four hours between them. There were a few bumps in the surface from blown dust, dead flies, or whatever, so I decided to do a sanding before the final coat. The instructions recommended letting the product setup for 72 hours before doing any smoothing, so it sat like that for three days. When sanding time came, I'd been late getting home from work and we were having occasional showers. During a break between the precipitation, some supplies were found, and I crawled back under the boat where it was still dry. The first job was to knock down the high spots with a scraper. Then, from my limited inventory, a course belt from a sander was used. To finish it off, a mesh sanding strip was placed in a block and everything given a good going over. It was looking pretty nice at this point, and ready for more paint, but daylight was fading. At my next opportunity, two more coats were applied, for a total of five. Once dried a few hours, the boat was towed down to the marina. 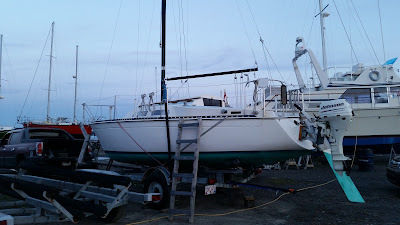 While waiting a day for the final coat of Rust Bullet to dry, the mast was stepped, engine and rudder attached, and various other little jobs completed. The next day, while on lunch break from work, I bent on the sails, and generally got the boat ready to launch. 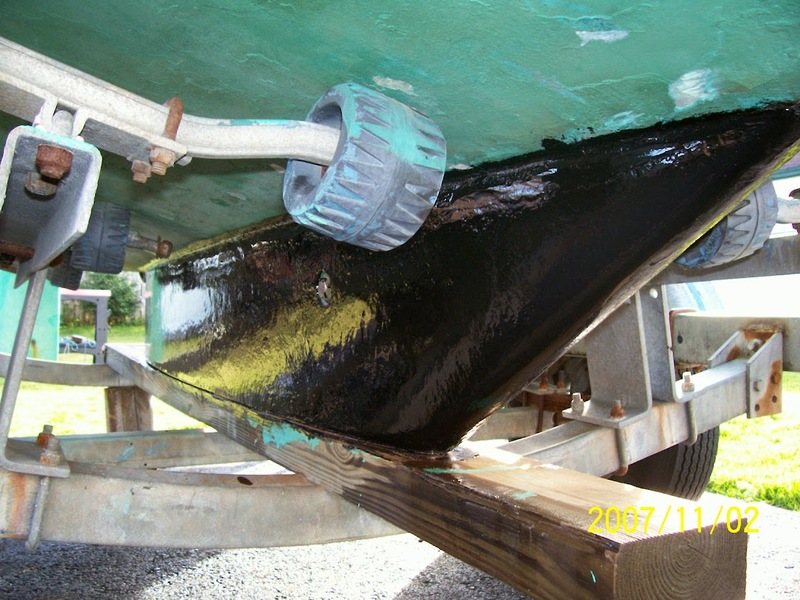 That evening, the scant amount of green antifouling remaining in the old can was used up patching the upper edge, while the new blue antifouling paint went over the freshly sealed iron keel. No one would see the clashing colours once it was in the water, and the green will all be scraped off when the boat comes out. Launching the next day didn't go smoothly, as per norm. The nut fell off the jack wheel somewhere along the way, and the bolt slipped out on the ramp, essentially acting like a flat tire. Someone had a small hose clamp we used to hold it in place to finish launching. After checking the boat for leaks, and making sure the motor was working properly, we moved over to the dock. Next up, tuning the rigging, and making the boat ready for sailing and living aboard. 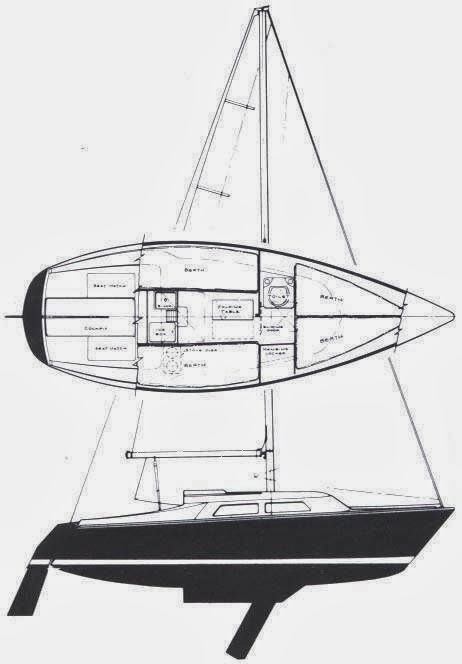 What about the pocket where the swing keel goes and the swing keel ? That hasn't been an issue. The keel swings freely. If it were to stick, I'd have to come up with some solution for getting at it.